Home/Best Picks/Accessories/What Are The Best DJI Mavic Air Cases & Backpacks? There’s no doubt that getting a new drone is an extremely exciting time. But, finding a way ​to safely ​transport your beloved UAV from place to place can be extremely tough to say the least. That’s why we’ve compiled this in-depth list of the best DJI Mavic Air cases and backpacks currently available. Whether you’re looking for a military grade case, or a lightweight backpack our list of the top Mavic Air cases & backpacks has you covered. Case VS Backpack: What’s best for you? Below we’ve listed some of the benefits and drawbacks of drone cases and backpacks. This should hopefully allow you to distinguish which option is better for you. Bear in mind there is no right or wrong option here, the best case or backpack for your Mavic Air will completely depend on your own individual needs. What Should You Look For In The Best Mavic Air Cases & Backpacks? When looking to get a case or backpack for your Mavic Air, there are a number of key aspects that you should pay attention to. How you’re planning on using your case/ backpack will determine which of these are the most crucial. For the casual drone pilot, portability is going to be a massive factor, as no one wants a case or backpack that’s hard to carry. If you’re going to be travelling long distanced with your Mavic Air, a suitable backpack that’s easy to carry will probably be your best bet. Depending on the number of accessories you have and whether you bought your drone in a bundle, your cases storage space is going to be extremely important. Each pilot is going to have their own unique set up, so finding a case or backpack that is able to cater to your equipment is vital. The best case for your Mavic air will be able to safely store both your drone and any accessories that you're wanting to use, for example spare batteries or propellers. The quality of material used will tie in closely with the price of the product. As with most things in life, you tend to get what you pay for. Although likely to cost more, it's best to look for cases and backpacks manufactured to a high standard using durable and protective materials. ​This is because the whole reason of getting a backpack or case is to protect your drone whilst you're traveling, so it's extremely important that it offers a sufficient amount of fortification. We’ve tried to make our list of the best DJI Mavic Air cases cover a wide ​range of prices. Higher quality items (such as Lowepro cases) will tend to be more expensive, however they will most likely last a lot longer and offer your drone more protection. Up ​first on our list, we’ve got on one of the most popular drone case brands of all time, Nanuk. Nanuk our renowned for producing military grade cases for drone pilots, with their latest release catering for the new Mavic Air. This case comes in two sizes, the larger size designed to fit the fly more combo, with the smaller size being designed to fit a more basic set up. You’ll struggle to find a more protective case for your Mavic Air, that I can promise you. The Nanuk features a patented powerclaw latching system, designed to stay shut no matter how much of a battering the case is enduring. The case itself if both dust and waterproof and is manufactured using Nanuks impact resistant NK-7 resin. To top this all off, the case comes alongside a lifetime warranty, so if anything goes wrong with it, you can get a replacement free of charge. As I previously mentioned the Nanuk case comes in two different sizes. The larger of the two is designed to store the Mavic Air alongside the fly more combo. The smaller case is able to fit the Mavic Air, alongside a spare battery, transmitter, phone and charging cables. The Nanuk Hard Case is without doubt, one of the best DJI Mavic Air cases on the market. If you’re looking for some serious protection for your drone, look no further. ​Next on our list of the best Mavic air cases is the Casematix Waterproof Case. We’ve featured Casematix a number of times on DroneRiot, as we love their affordable, high quality cases. The case itself is designed for those of you who do not have a large amount of accessories and are looking for an easy to carry, protective case for your drone. It’s worth noting that the Casematix doesn’t have room for a charger, so if you’re planning on traveling for long periods of time with your drone, this may not be right for you. The case is manufactured using high density polymer material that’s extremely rugged and able to withstand the bumps and knocks that it’s bound to encounter. ​Inside the case is lined with high density foam that’s able to absorb the shock of any impact, greatly reducing the chances of any damage being caused to your drone. This foam is also precisely cut specifically for the DJI Mavic Air and its accessories, meaning that your drone will fit nicely inside the case with minimal movement. The Casematix is definitely designed for a more basic set up, which for most pilots is completely fine. However, if you’re a pilot with a tonne of accessories, one of the other cases on our list may be a better option. PolarPro are another well known manufacturer of drone accessories, producing a wide range of products from ND filters to carry cases. One thing that all their products have in common is quality. Although PolarPro cases tend to have a pretty cheap price tag, they’re made using top of the line materials that are both protective and designed to last. This is the first of two PolarPro models on our list of the best Mavic cases, both of which are great options if you’re planning on traveling with your drone. As I just mentioned, this is the first of two Polar Pro cases on our list (The Minimalist and The Rugged). The Rugged Edition is designed to provide the most protection out of the two and is perfect for pilots who are going to be in more demanding locations. The exterior of the case is made from high quality, durable material that’s incredibly lightweight, meaning that is it both easy to carry and extremely protective. The inside of the case is made up of a large, shock absorbing foam insert that is designed to specifically house the Mavic air and its’ accessories. This will help to shelter your drone from any unexpected knocks. As you can see, the case is able to fit a decent amount of accessories considering its small size. However, if you’re planning on taking a lot of accessories with you to a shoot, you may need something slightly bigger. 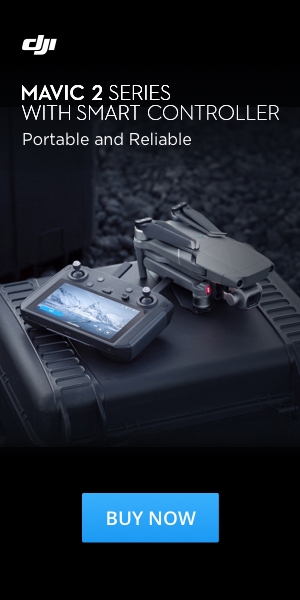 If you’re looking for an easy to carry case that will protect your drone in harsh conditions, the Polar Pro rugged edition is definitely one of the best DJI Mavic Air cases for you. Moving onto the second PolarPro model on our list of the best Mavic Air cases. The Minimal Case is designed to be placed inside another backpack and as such does not offer as much protection the rugged edition. As with all PolarPro products, the minimal edition is built to an exceptional standard as is a fantastic option if you’re interested in a lightweight case for your Mavic Air. To be honest, the PolarPro minimal edition isn’t the most protective model on our list of the best DJI Mavic Air cases. This is because the case is designed to fit inside another backpack, which in turn will provide another layer of protection for your drone. The soft shell exterior does add some protection, but no where near the same as some of the hard-shell cases on the list. Fortunately, its’ inside is lined with shock absorbing foam which helps to dissipate some of the trauma your drone receives from any impact. The storage compartments aren’t cut to the specific size of the Mavic Air and its accessories, instead PolarPro opted for a slotted partition design. This means that the drone and accessories will move around slightly more, however the inside of the slots are lined with foam, which does help to cushion your equipment. As previously mentioned, the case is divided into 4 separate compartments that can be used to store your drone and accessories. 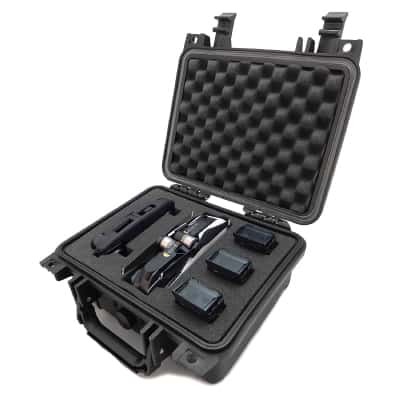 Unlike other cases where the foam is cut to fit specific equipment, the partitioned design of the minimal case allows you to pick and choose which accessories you’d like to bring and where you can store them. There’s also a mesh compartment located inside the case which can be used for storing exatra accessories such as a phone, charging cables, ND filters etc. The final case on our list is the Khanka Hard Case the DJI Mavic Air. 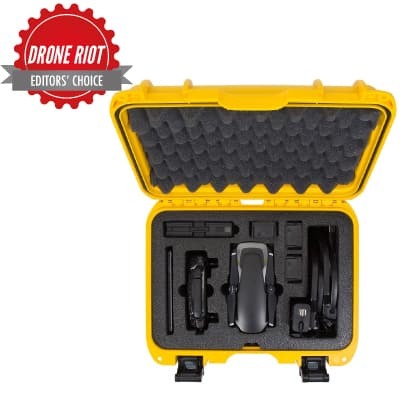 This is a pretty cheap and cheerful case that allows you to easily and safely carry your drone around. The case doesn’t come with a tonne of bells and whistles, but will provide your drone and accessories with protection when your moving from A to B. To top it all off, the drone is one of the cheapest on our list, making it a fantastic option for those of you on a tight budget. 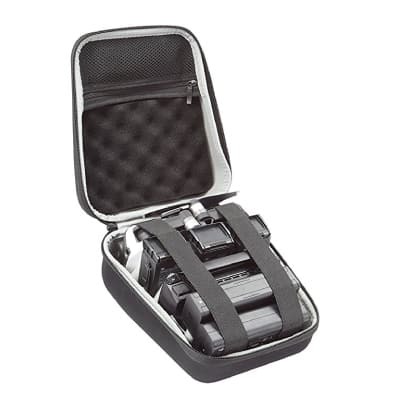 Made using premium EVA materials, the hard case offers ample protection for your drone and accessories. The rigid hard shell exterior paired with the shock absorbing foam interior makes the case the perfect shelter for your UAV. Although not able to store a tonne of accessories, the Khanka hard case has ample room for the equipment needed for a long and successful flight. 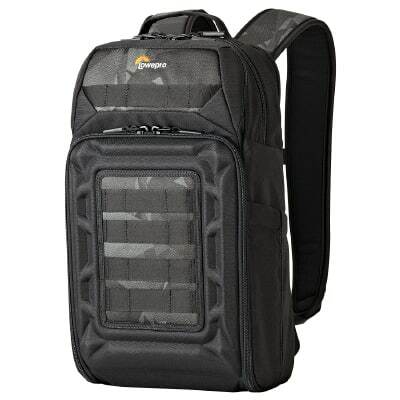 LowePro are an extremely popular brand of camera backpacks and cases. They offer a wide range of products, catering for different products in the film/ photography industry. LowePro were one of the first to catch onto the massive rise in popularity of drones and released a whole new range of backpacks especially for UAV’s – enter the DroneGuard series. Although costing a fair amount of money, LowePro products tend to be built to an exceptional standard and feature incredibly intricate and well thought out designs. The BP 250 being no exception. 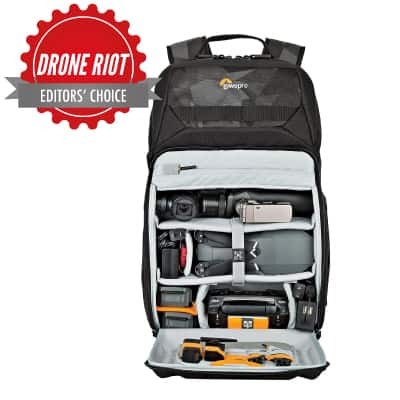 I’ve used a number of LowePro’s DroneGuard backpacks over the last year or two and have never been disappointed, which is why I recommend the BP 250 as the best backpack for the DJI Mavic Air. 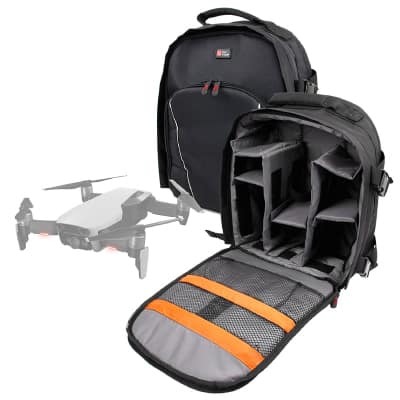 Although the backpack itself is not designed specifically for the Mavic Air, the customizable interior makes it perfect for any small quad copter, including the Mavic Air, Mavic Pro and DJI Spark. The exterior of the backpack features LowePros own compression moulded FormShell. This is an extremely rigid yet lightweight material that provides a serious amount of protection to your equipment inside. 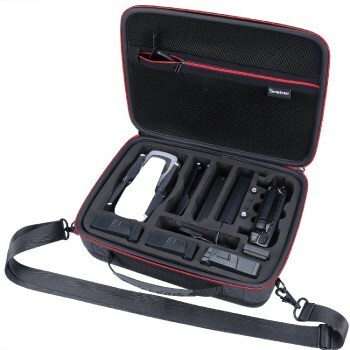 The compartments inside the case are also lined with foam in order to cushion your equipment and protect it from any impact that the backpack may encounter. Inside the backpack features removable organization panels alongside elastic straps that keep your equipment securely fastened whilst you’re on the go. Moving onto the second LowePro model on our list of the best DJI Mavic Air backpacks, the DroneGuard BP 200. This is slightly smaller and cheaper than the BP 250 model we just discussed, but still offers much the same in terms of comfort and protection. As with all DroneGuard backpacks, the BP 200 features a compression-molded formshell exterior that offers a tonne of protection to your equipment inside. The customisable compartment slots are padded in order to provide some cushioning for your drone and accessories. One of my favourite aspects of the BP 200 is how the transmitter compartment features protection pads for the transmitter’s sticks. This is one of the most delicate areas of the transmitter and therefore requires as much protection as possible. I would also recommend getting some joystick protectors, which are an extremely cheap but handy accessory for your drone, as they’ll completely stop your sticks from moving during transit. In terms of storage, you really couldn’t ask for much more from such a compact backpack. What makes the DroneGuard BP 200 one of the best DJI Mavic Air backpacks is its customisable inside. You’re able to remove and adjust the padded compartment slots to your preference and set up, allowing you to use the backpack for pretty much anything, as well as for your drone. Netted storage space for extra accessories e.g. tablet, charging cables etc. The final item on our list of the best DJI Mavic Air backpacks is the Duragadget water-resistant rucksack. Costing less than $30, the backpack offers insane value for money so if you’re on a tight budget, this is a fantastic option. Its customisable inside allows you to use this as a backpack for not just your Mavic Air, but for any other drone/ camera equipment you may have. Unfortunately, the backpack doesn’t offer much in terms of protection. With the external material being pretty thin, ​extra care should be taken when travelling with your drone on your back. Having said that, the customisable panels are lined with foam providing a layer of protection for your drone and accessories. The bag also comes with a waterproof cover which you can put over the backpack if you get caught outside in the rain, which lets be honest is bound to happen at some point. The backpacks customisable interior allows you to optimise its space for your specific set up. Whether you’ve got 1 battery or 4, how you arrange the backpack is completely up to you. So what do we recommend as the best DJI Mavic Air case and backpack? Take the time to assess whether a case or backpack is right for your situation. If you’re going to be walking long distances, comfort and portability are going to be important for you. Therefore a backpack is your best bet. Whereas if you’re looking for a serious amount of protection and will be flying in challenging locations, a hard case is probably more suitable. I hope you’ve found ​our article on the best DJI Mavic Air cases and backpacks helpful, if you have any questions please feel free to comment below.